The weather can sure change the outcome of any trip in the White Mountains. The Original plan of summitting the Wildcats via the Polecat ski trail and crossing the ridges of D,C,B, & A peaks in the winter was a stretch even in better winter conditions. The Mount Washington area was blanketed by nearly 2' of fresh snow the day before our arrival, making the entire Wildcat Ridge too rigorous and dangerous in a day's journey. I did not want to risk being out on the ridge in the dark with a group. 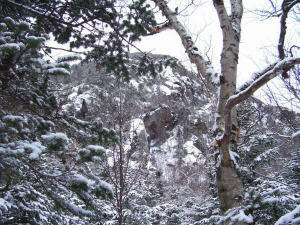 Our group of 5 decided it best to hike the well broken Nineteen Mile Brook Trail to the Carter Notch Hut. Based on time of arrival and ability to unload some gear at the hut, we could then make the decision as to what to do? Our options were Wildcat A that afternoon, or attempt the entire ridgeline in reverse on Sunday. We spotted Carol's car at the ski resort so this option would be open. We arrived @ the hut around 1PM and grabbed our bunks, unloaded the evenings food in the kitchen storage area, and had lunch. The caretaker does not start the fire to 5PM, so hanging around and being wet and cold seemed foolish. We set out to attempt " A" peak. The books were right. This is not a frequented Winter route. The trail up to Wildcat was not broken and rugged. This is the AT, so finding low hanging white blazes on an unbroken trail can be quite the chore. There was immediate concern that as we slowly tried to chug up "A" peak, we were off the trail. We eventually found blazes that determined that we were on trail but were on sliding ledges and grueling upward climbs that made for extremely slow going. We got, perhaps, half way up "A" peak and decided we were spent. Dinner and a fire was too appealing. 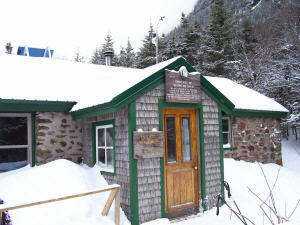 The Carter Notch Hut is more rustic than Zealand where we typically do our winter overnights. Sleeping quarters and the privies are all in separate buildings. Putting on one's boots which were frozen blocks of ice in the night to go to the bathroom was a challenge. The drinking and cooking water must be taken from the Lake which has an augered hole covered with a big wooden cover. Ed, Myself, and Paul were water fetchers that night and got a great moonlight view of the peaks off the Lake. We were all able to view the evenings entertainment from the hut which was the lunar eclipse at dinner time. We all slept well and awoke to Ed's signature oatmeal and Charlene's bagels. We decided to hike out that morning and were all glad that we did not attempt the Wildcat Ridge. This is a summer hike! Stay tuned! Seeing the lunar eclipse and enjoying the moonlit summits made this overnight a success.